The season of glitter has started! From now until Christmas, no matter how hard I try to be neat and tidy, I will be leaving a little trail of glitter all over the house and will have a constant scattering of it on my clothes, face and through my hair! All in a good cause though - I do love a sparkly Christmas card! I added the Jingle Bell to the end of the hat with Silver Metallic Thread. I couldn't resist this little guy! 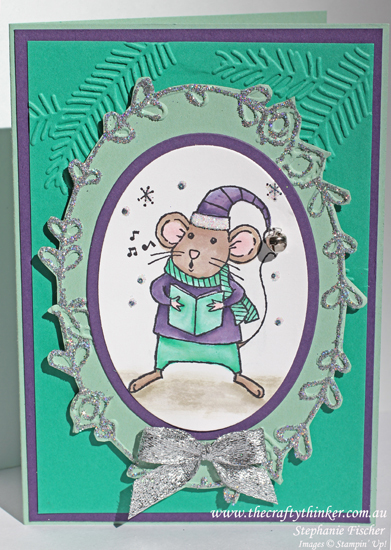 He's from the Merry Mice stamp set in the new Holiday Catalogue. I added some Dazzling Diamonds glitter to his hat and a few dots in the background. For the first time in years, I threaded a needle (!) to attach the Jingle Bell to the end of the hat. Then I had to have a rest after all the excitement! By the way - I'm not telling my husband how the bell is attached (fortunately he hasn't asked) - I remain a confirmed non-sewer! To make the glittery little plaque that surrounds him, I ran a piece of Mint Macaron cardstock through the Big Shot in the new Pretty Paisleys embossing folder. I then cut around the edge of the embossing before adding some glue with my new best friend - the Fine-Tip Glue Pen and shaking on some silver glitter. If you don't yet have a copy of the 2016 Holiday Catalogue and meet the following criteria, contact me to request a copy. (Available to Australian Residents who are not Stampin' Up Demonstrators and do not currently have a Stampin' Up Demonstrator).